These universal use high current electron sources provide a wide range of beam currents and spot sizes. Beam blanking is one such advantage. The beam can be switched on and off electrically, using a manual switch, controlling electron extraction from the filament. This method avoids the generation of stray electrons. Electron sources from STAIB produce an electron beam that can be pulsed to produce sharp power pulses up to the microsecond range. Applications include sample annealing, heat treatment, evaporation, heat shocks, and luminescense studies. 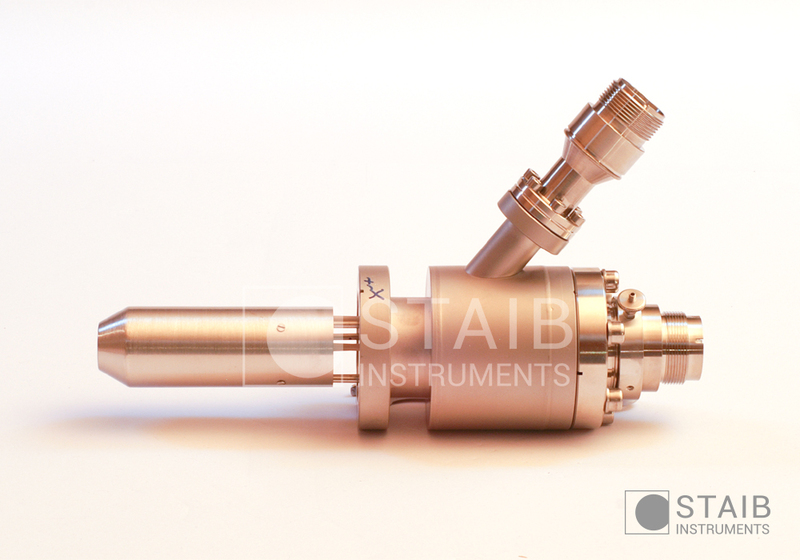 Beam pulsing is available on all focused electron sources offered by STAIB Instruments. Several standard pulsing options are available to cover a wide range of frequencies. Customization is also available to meet the needs of specific experiments, such as additional ranges of pulse widths. Pulsing to 100 Hz can be provided as an option to the electron source power supply. For pulsing beyond this frequency, in addition to the electron source and power supply, a pulsing unit plus a special high voltage cable, that provides an input from the pulse unit (a pulse control signal), are needed. The pulsing unit has an internal clock or allows an external TTL pulse signal to give it a reference signal. Several standard pulsing units are available to cover a large range of frequencies. Other ranges of pulse widths are available on request. Please contact our office for specific details. The electron source power supply is equipped with an optional computer connection plug for use with analog control signals. The electron source system can either be operated by using the manual control dials, or by using the optional computer control. The control voltages can either be provided by 3rd party software through a suitable DAC interface, or by the STAIB computer control module. 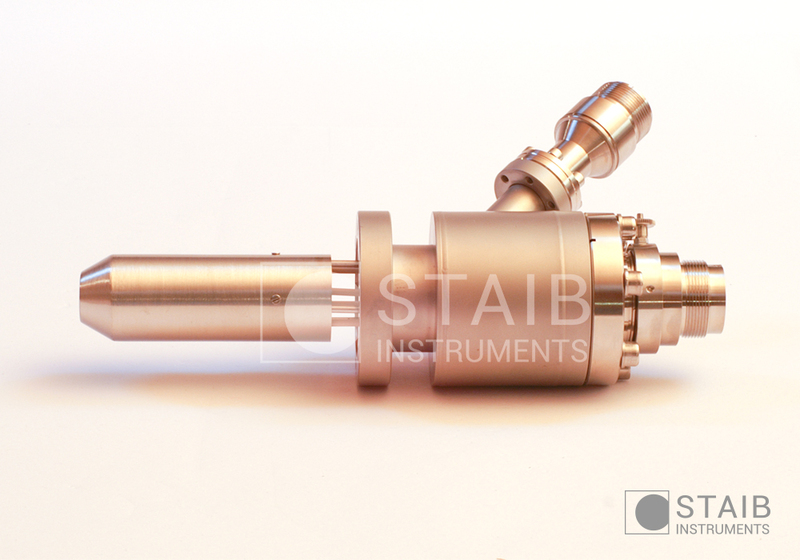 STAIB Instruments electron sources can be equipped with magnetic shielding. The shielding may be necessary because a magnetic field influences the electron beam. A static or DC magnetic field will shift the beam and an alternating field will wobble the beam. This can cause fluctuations in beam position, size and current. The magnetic shielding is made of a highly ferromagnetic material. For this reason, it can be used to shield low frequency magnetic fields from the surrounding environment. 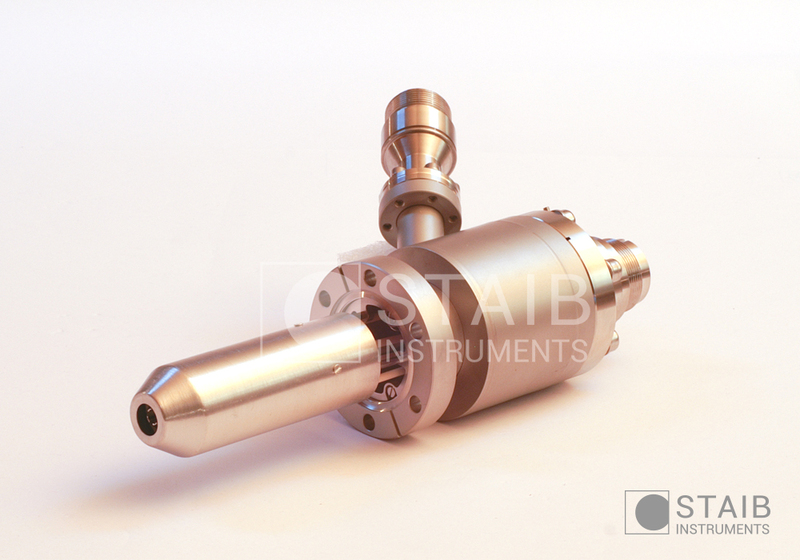 STAIB Instruments offers Scanning Electron Microscopy (SEM) products designed around our electron sources. For beam diameters below ca. 10 microns, bright and detailed images of the sample are obtained in SEM mode. 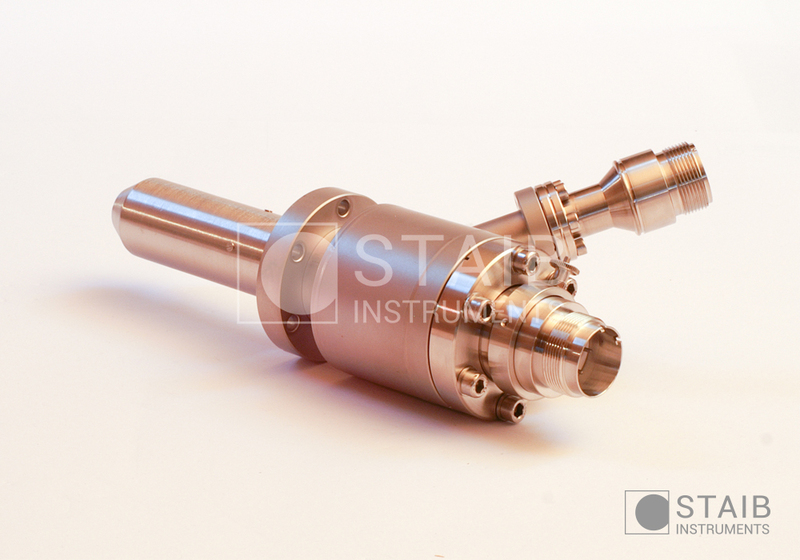 A number of specific electron guns covering a wide range of beam diameters and energies are available. Any of our microfocus sources may be used. Other STAIB electron sources may be used if higher lateral resolution is not needed. The Beam Current Controller (BCC) is a microcontroller based unit used to regulate the electron beam current of the electron gun, as used in RHEED or AUGER techniques. Regulation of the electron beam current to a fixed, precise, user-adjusted value is important when the electron gun is working in a higher pressure range and when using reactive gases in the vacuum chamber. Once adjusted, the BCC will regulate the beam current to the assigned value, even after gun parameters like beam energy or focus are modified. Operating values can be saved and will be kept after restarting the BCC module, ensuring identical experimental conditions. Electron Energy Loss Spectroscopy (EELS) / Reflection Electron Energy Loss Spectroscopy (REELS).